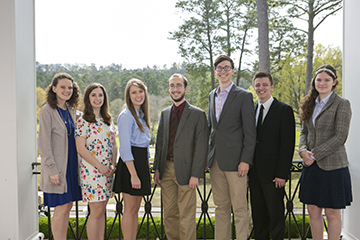 Eleven Samford University students have been honored by the Birmingham Center of Colonial Dames of America for outstanding papers written in Samford history classes. The winners received cash prizes for their work submitted in the annual Colonial Dames’ American Independence essay contest. Honorable Mention and $50 prizes went to four essay writers: Sarah Harbaugh, a freshman voice major from Owens Crossroads, Alabama; Rachel Johnson, a freshman mathematics major from Memphis, Tennessee; Delaney Harrison, a junior political science major from Cataula, Georgia; and Cole Arn, a freshman music and worship leadership major from Plant City, Florida. The awards were presented by Samford history department chair S. Jonathan Bass at a luncheon at Mountain Brook Country Club March 16. A collection of the winning papers was dedicated to Kathryn Hicks Porter in recognition of her service as Colonial Dames president. A bound volume of the essays will be housed in the Samford library.